Before I discovered blender muffins, I’d never have time to make muffins on a school morning. Sure, I’m up early enough, but I have 100 other things to do and don’t have the time to prep muffins. But blender muffins? Five minutes to prep, tops. You simply put the ingredients in the blender, blend, and pour into the muffin tin. So easy! If needed, you can even eat these in the car. 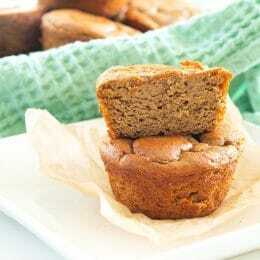 I make this recipe for customizable 5-ingredient blender muffins at least once per week. 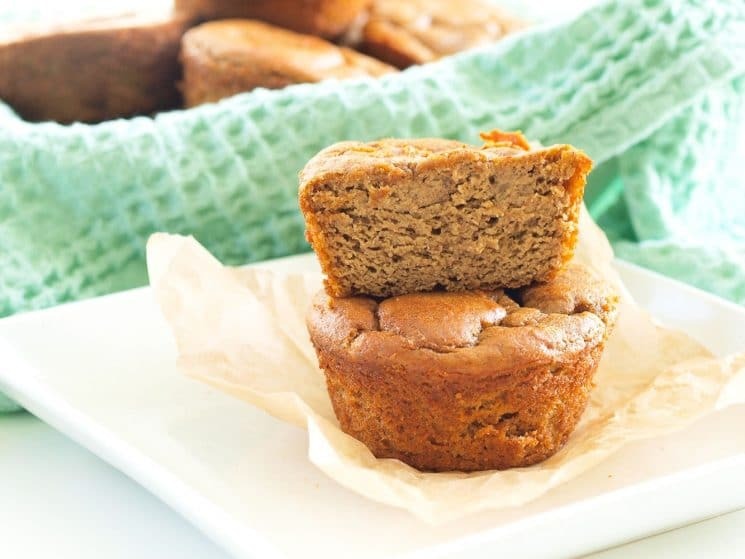 It’s my go-to weekday muffin recipe and my kids always gobble them up. Today I’m bringing you my new favorite version of the blender muffin. 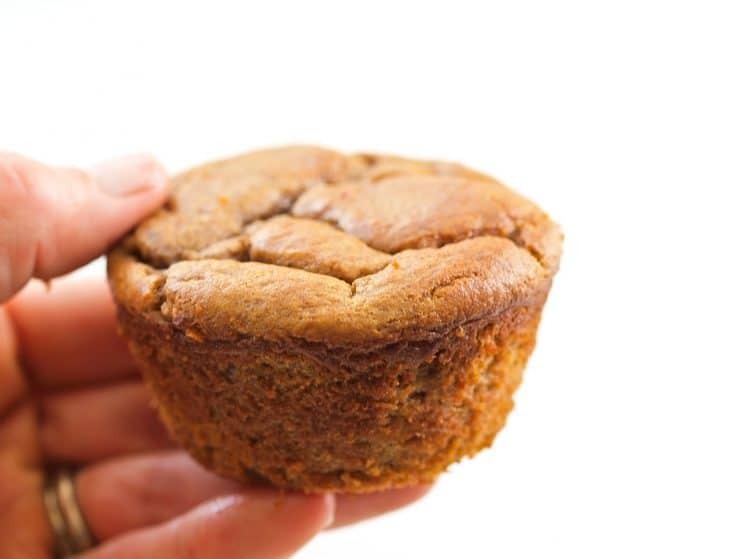 A blender muffin with a vegetable! I’m all about starting our day on a healthy note, and it doesn’t get much better than having a vegetable with your breakfast. These Sweet Potato Blender Muffins are made with no flour, no oil, and no refined sugar. I was skeptical about making a muffin with no flour, but it works! You’ll notice the texture isn’t exactly like that of a regular muffin, but it still has a light crumb that is very muffin-like. You’ll also notice that without flour, they don’t rise as high as traditional muffins. Don’t let that stop you from trying these. I love having my kids start their day with a muffin where the number #1 ingredient is a vegetable instead of flour. I’m the only person in my family of four that likes sweet potato, but everyone loved these. They have a lovely spiced flavor that is perfect for fall. If your family is reluctant to eat sweet potatoes, this is a great way to get them to eat this super food. And now your busy mornings have time for muffins! Maryea is the mama behind the healthy lifestyle blog Happy Healthy Mama, where she shares simple, real food recipes and inspiration for raising healthy kids in a natural home. 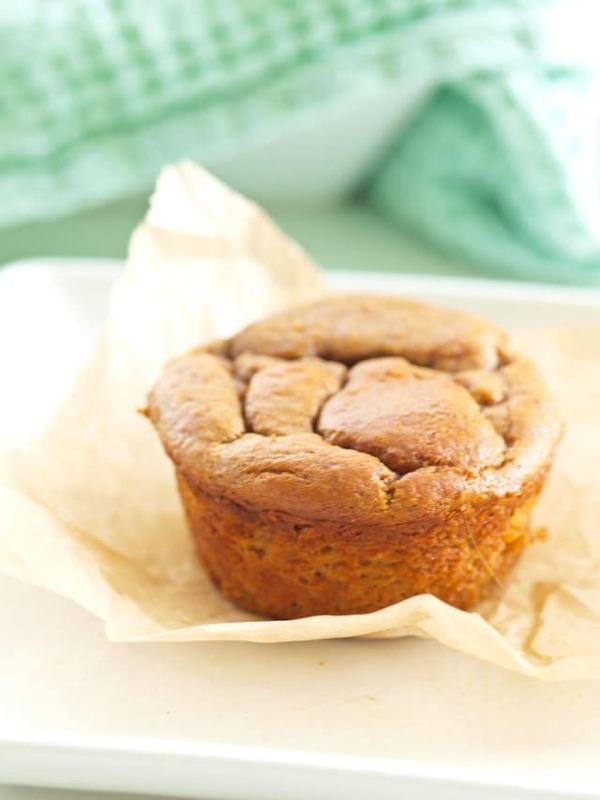 Bake in preheated oven for 18-20 minutes until a toothpick inserted in the center of a muffin comes out clean. Could you use honey instead of maple syrup? Yes, honey should work fine. These sound delish! I noticed maple syrup is listed twice though. Is that correct? Yes. The correct amount is 2 tablespoons + 1 1/2 teaspoons. The recipe above calls for 1/4 cup + 1/8 cup maple syrup. That is the equivalent of 6 tablespoons. Might be worth updating the recipe…. Heidi- we use an ingredient database so shopping lists, and nutrition data can be calculated for our member site- It made more sense to use cups here, so we had to use the measurement in cups, closest to 6 tablespoons. What could you use as a substitute for almond butter since schools are nut-free? You can use sunflower seed butter or soy nut butter. Is there something I could substitute for bananas for those with an allergy? Maybe applesauce? I have not tried using applesauce in this particular recipe, but have had good luck using it in place of bananas in other blender recipes. I hope it works for you! Yes these can be frozen. I freeze them and then I take out the night before and they are perfect in the morning. They have a great texture, soft and lots of flavor. This is a recipe to keep! The recipe says it calls for 1/4 cup pure maple syrup and 1/8 cup pure maple syrup. Which is it? Or is it both? It’s both- it’s supposed to be written: 1/4 cup plus 2 tablespoons, but our ingredient database didn’t offer tablespoons for the syrup. Do these work using an egg substitute like flax or chia “egg”? I’m wondering the same thing. I have a child allergic to Eggs. what is the correct amount for honey? i tried these and looked nothing like the picture. had consistency of pumpkin pie and sunk in the middle. Epic failure! Did you use Honey Dawn? Or maple syrup? Could natura PB be used instead of almond butter? just a quick question about the cream cheese. Are you using an 8 oz. container of pre-whipped cream cheese? Or, do you mean a regular package of cream cheese that you whip yourself before adding the eggs? I tried making these. They didn’t turn out at all. The middle had the consistency of a scrambled egg. They stuck to the pan, I could only retrieve half the muffin. They didnot rise as shown in the picture. Good flavor though. Yum! These are definitely a different texture than typical muffins. They almost remind me of mini pumpkin pies but not quite that wet or dense. My 3 yr old and I just ate several out of the oven. Thanks! Can these be done with squash ?? Sunken in middle. Consistency of pumpkin pie; not that of a muffin. Major disappointment, but yes good flavor. Sadly, due to the consistency, my daughter probably won’t eat them. I made these and they were way too soft in the middle. The outside was browned like a muffin, inside mushy. Increasing the cook time did not help at all. Next time I would add more dry ingredients like rolled oats. I also had mine sink in the middle. I was glad to read that I wasn’t the only one. They smell and taste amazing. I think I will try them with some oat flour in them to bulk them up and see if that helps. Mine really stuck to the pan. I put them back in the oven and that helped a bit. Glad to try them, but probably wouldn’t make again. The difficulty getting them out of the pan made them kinda high maintenance. The flavor is good though! These were fabulous!! Followed the recipe spot on and they turned out perfect! Definitely a little more dense than a muffin but I love them. They taste so good and have a lovely fall spice feel. My son gobbled them right up. Can these be frozen? How long do they last and how should they be stored please? Just have to chime in here reading all these negative comments.. These are my FAVORITE breakfast muffins. Talk about easy! And my first time making them the middle was too gooey also. But I didn’t give up because the flavor was so awesome. **Make sure to measure the sweet potatoe as instructed** and experiment w different nut butters. Not all almond butters are created equal;) The best I’ve found is Barney Butter Almond butter. The last time I made them my 7 year old (very picky) daughter said “Mom these get better every time!”. And as far as them sticking I too had that problem until I bought liners. Keep trying!! They are worth it! Can you substitute canned pumpkin for sweet potato? These are amazing! I had to make a second batch because my kids ate the whole first batch in less than a day! Following the measurements is crucial, even one scoop over the 3/4 cup sweet potatoes can be a goopy mess. As long as you follow exactly they turn out super delicious and I highly recommend! How much canned sweet potato purée would you recommend in place of one sweet potato? My twin 16 months olds loved these. Subbes natural peanut butter for almond butter bc that’s what I had on hand and it worked great. My husband texted me at work telling me how the boys “gobbled” their muffins. 🙂 Thank you! These turned out well, the whole family seemed to like them, including me-the pickiest eater of the bunch! I have a can of pumpkin, could I substitute with that next time? Would it still call for 3/4 c.? how much canned pumpkin do you think i should use instead of a medium sweet potato? Can you substitute more sweet potato in place of the banana? Maybe I just don’t have a lot of experience with flourless recipes, but I found the texture to be kind of strange. I kept putting it back in the oven because I thought it wasn’t fully cooked. I stopped when the top started to turn a little *too* brown, and the inside was still a bit… mushy. But my kid ate this without a complaint, and I liked the taste. Great flavor. Does have a quiche consistency! 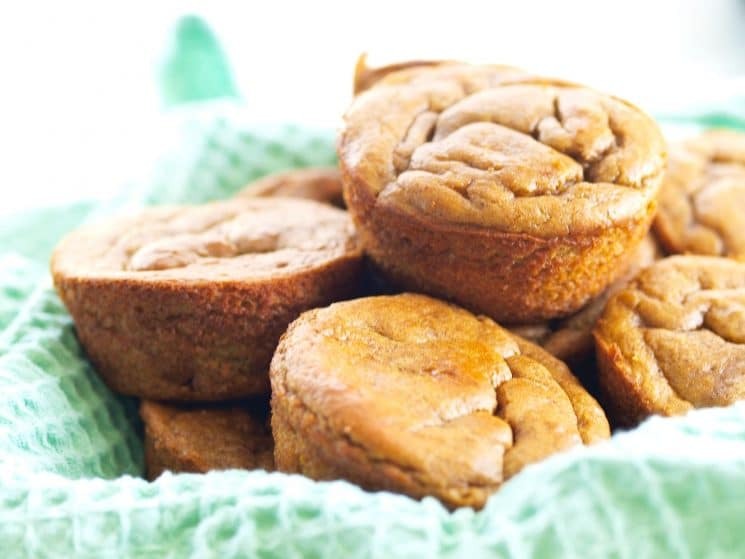 I whipped these in my vitamix – they were creamy and my kids loved them!! May take an adjustment if you expect flour type texture. Thanks for the recipe, anyway!! Dang Mollie! We’ll have to do some egg free testing on that. The recipe look yummy! I’ve got some tahini left, can I use it instead of almond butter? I made these tonight and had to swap out the egg for applesauce because of allergies. The batter tasted DELICIOUS (I couldn’t help “test” it) and my mini muffins turned out great. But I did a mix of mini/full-size and the full size browned on top but never baked fully through. I agree with the comments that you need to double-check your sweet potato quantity because that might have been my issue! I will definitely try again next time I have leftover sweet potatoes/bananas because, even eating with a fork, these are yummy! Yum my kids loved this! I added 2c spinach and 1c shredded carrots and 1tsp vanilla. So moist and yummy! I don’t see an answer to the question on substituting pumpkin for the sweet potato, how much would that be? 1 cup?